At the Terradimare Resort & Spa in San Teodoro, on the Italian island of Sardinia, there’s no need to choose one over the others. With its 65 wonderful accommodation units (divided between guest rooms and independent apartments nestling in the lush countryside), the 4-star Terradimare Hotel and Residence is perfect both for couples – who want to spend their days sunbathing poolside, cocktail in hand, before heading out to explore the night-time entertainment – and for families with children, who want to make the most of Sardinia’s most glorious beaches and most crystal-clear stretches of sea. The Terradimare Resort and Spa was built in 2009, within a quiet residential district of San Teodoro, one of the most celebrated tourist places on the north-eastern coast of Sardinia, just 15 or so miles to the south of the Olbia - Costa Smeralda airport, which can easily be reached by car along the SS 131 D.C.N. road. A short, 10-minute stroll will take you to La Cinta beach, which is among the most renowned of the entire coast, and which is also accessible using our free shuttle service. Equally close by is the beating heart of the town, with its vibrant nightlife and myriad attractions. If you are looking for a place where you can re-charge both body and mind like never before, then make your way to Mendula, our exclusive spa, with its hydromassage tub, sensory showers, “wet trails”, massages and exclusive body and facial treatments. And for those who love adventure and outdoor pursuits, the choice is almost endless. Our personnel will give you valuable advice on the excursions and itineraries that best match your tastes, recommending the best places to discover untainted natural paradises, protected marine and lagoon areas, mountain trails, archaeological sites and natural wildernesses like no others on the planet. 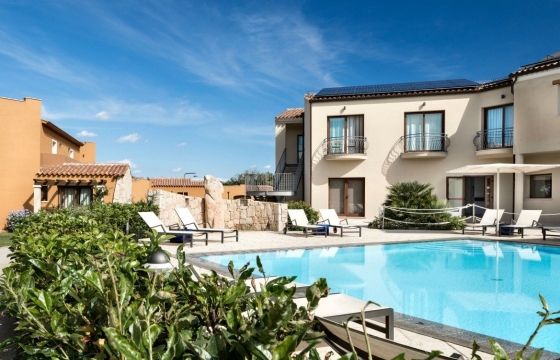 In short, the Terradimare Resort & Spa offers a fully rounded holiday experience in a priceless setting that remains a haven of peace and tranquillity even in high summer. Select the accommodation that suits you, choosing from Classic or Comfort Rooms and Junior Suites, or opt for a beautiful private apartment using the self-catering package. Sardinia, San Teodoro and the Terradimare Resort and Spa look forward to welcoming you in person. Have a fantastic holiday!